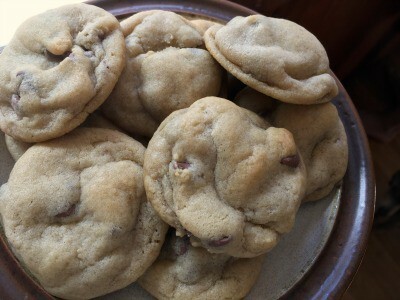 I am a chocoholic, but when it comes to chocolate chip cookies, I am actually a bit picky. Some are too hard. Some spread too much. Some get easily over-baked and get crunchy and caramelized tasting. I want them soft. I want them to hold their shape without being thick and dry. I’ve been on the hunt for the perfect chocolate chip cookie forever. And I think I’ve finally found it! My son and I tried a bunch of different recipes and fiddled with them a bit until we settled on this one. 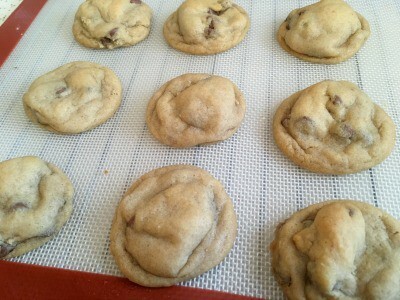 You’ll notice that recipe lists something a little different than your average cookie- just trust me. It will all work out in the end! In a large bowl cream the sugar and butter until nice and fluffy. This should take at least 5 minutes. Scrape down the sides of the bowl when necessary. Add in the vanilla. Add in the flour, baking soda, and salt. Mix everything until it’s thoroughly combined. Now grab your baking tray- it’s best if you can line it with parchment or a silicone mat. Measure out your dough using a tablespoon and roll it into a ball. Place them on your tray about 2 inches apart. These cookies don’t spread too much, but give them room. Stick the tray in your hot oven and bake for about 10 minutes. You want the edges to be set and just barely brown. Under baked is much better than over baked. Once they are done in the oven, allow them to cool for a few minutes before transferring them to a rack. Eat them warm or allow them to cool before storing them in a covered container. If you give these a try, let me know what you think! This is better than anything I have ever eaten, I LOVE THIS!!!! Is this for real?! Hard-boiled eggs? I’m so curious, I have to try this!